President Obama: Don't Leave Dakota Access to Trump. Divest from the banks funding the pipeline. Join or organize an action in December as part of the Global Month of Action. See the map of actions here. Go to Standing Rock to show your support and see what's happening. Show up prepared to take care of yourself and to act as an ally. Here's 5 things to consider before going to Standing Rock. Tell President Obama to stop Donald Trump from deciding the future of Standing Rock’s water and stop the Dakota Access pipeline by rejecting the final permit for the project. The Dakota Access Pipeline would cause irreparable harm to sacred land and water as well as the climate. Don't leave the fate of this project in the hands of Donald Trump. Reject the permit and make Standing Rock a national monument that will protect it for generations to come. Thank you for taking action to stop the Dakota Access Pipeline. Now, help spread the word by sharing this with your friends on social media with #NoDAPL. 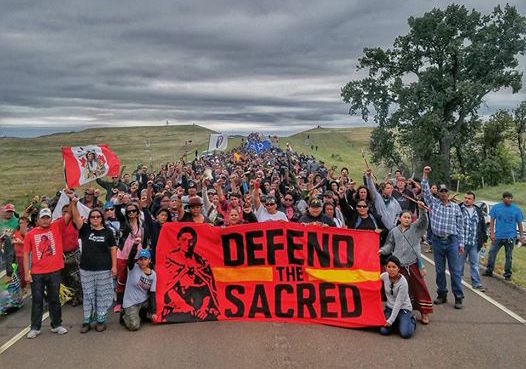 Donald Trump is going to be President in 2 months and right now the US Army Corps of Engineers is delaying its decision on the Dakota Access pipeline for more consultation. Tribal leaders, scientists and millions of people across the planet all agree: this project is a disaster and should be rejected. President Obama should stand with them. photo: Eman Mohammed Here are more ways to support activists on the front lines: Donate to the legal funds, supply funds, or send supplies: International Indigenous Youth Council Oceti Sakowin Camp Sacred Stone Camp legal fund and supply fund Standing Rock Medic and Healer Council Divest from the banks funding the pipeline. Join or organize an action in December as part of the Global Month of Action. See the map of actions here. Go to Standing Rock to show your support and see what's happening. Show up prepared to take care of yourself and to act as an ally. Here's 5 things to consider before going to Standing Rock.